The weather is getting colder, and I'm drinking more coffee now throughout the day to warm up and feel cozy. I'm also already thinking about Christmas cookies, which for some reason always make me think of biscotti. Biscotti definitely isn't a Christmas cookie, but that seems to be the only time of year I make them. I made these almond biscotti previously. Sure enough, it was in December. I'm already dreaming about an eggnog biscotti that I'd like to create for Christmas. Shockingly, I'm already seeing eggnog in the store! My favorite brand isn't out yet though, so I'll hold off on testing any eggnog related recipes until I can get my hands on it! 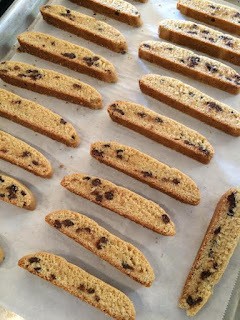 Even though biscotti is a multi-step process, it's so easy. It's such a nice snack with a warm drink, and I completely forgot how much I love it. The kids really enjoyed making this batch, likely due to the mini-chocolate chip component. My little guy even stirred them in this time, which was pretty impressive given how much thicker the batter is than your usual run-of-the-mill cookie. 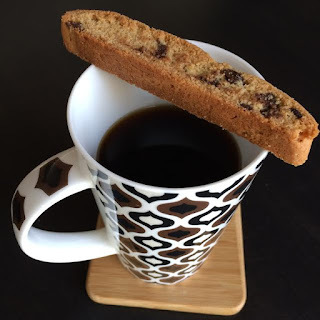 Here is my super simple chocolate chip biscotti recipe. Enjoy! -Cream together the butter and brown sugar until light and fluffy. -Add egg and vanilla, and beat until light in color and creamy. -In a separate bowl, combine the flour, baking powder and salt. Stir into the creamed mixture. Stir in mini chocolate chips. -Carefully transfer parchment to a wire rack and allow to cool for 10 minutes. -Using a serrated knife, cut the log on a slight diagonal into slices about 1.5 cm thick. -Place the slices on the cookie sheet, with the cut side down on the pan. 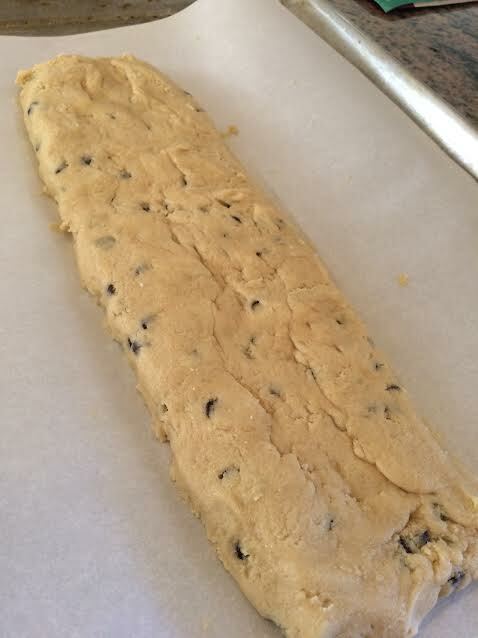 Bake for 20 minutes, turning biscotti at the 10 minute mark. Cool on wire racks.